Oscar-nominated & five-time Grammy-winning jazz trumpeter Terence Blanchard brings his band The E-Collective to the CBSO centre following the release of his brand new album, Live. "Government appears to give all its premiums to things in which men are likely to excel." #THSHLookingBack brings you two inspiring speeches from Town Hall in 1872. Looking back: How did Birmingham become a ‘stronghold’ for the suffragette movement? 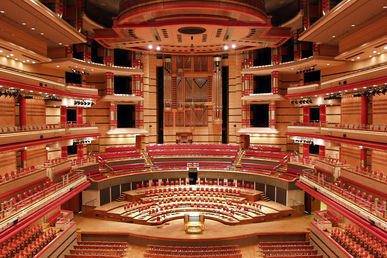 Town Hall Symphony Hall are shortlisted in two categories for this year’s Birmingham Music Awards (BMAs). The brilliant London Sinfonietta returned to Birmingham for the first time in six years to perform an an all-Reich programme. Ahead of this, THSH hosted a training day for the BBC's Broadcast Engineer and Broadcast Operator Apprentices. Last night, Hanson opened their UK tour at Symphony Hall. Ahead of their performance Taylor spoke to Town Hall Symphony Hall's Communications Officer Lauren Morton about what fans can expect on their String Theory tour. #THSHLookingBack explores two women's suffrage demonstrations in Town Hall in 1883 and 1886.